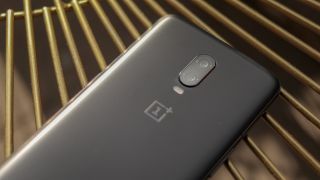 OnePlus has been open about its plans to bring a phone out in 2019 that's capable of connecting to 5G, but now the company is declaring war against its competitors by claiming it will be the first to offer a 5G-capable phone in Europe. An exact release date wasn't confirmed, but the company has unveiled a new partnership with UK network EE to bring the unspecified phone to the UK at some point in 2019. EE is planning to launch 5G in 2019 in 16 different UK cities, so coverage will be limited to certain areas at first. You can find out all the details we know so far about EE's planned 5G service here. Pete Lau, CEO of OnePlus, announced the news of the device launching with EE on stage at the Qualcomm Snapdragon Summit 2018. He also confirmed the phone will be powered by the latest Qualcomm Snapdragon 855 chipset. So far all we've heard for a release date is "2019", but we can venture a guess that it'll be toward the start of the year in order to beat the competition. Lau didn't confirm the name of the device on stage either. We expect this to either be the OnePlus 7, or perhaps the OnePlus 7T if the company decides to launch two phones next year. But it's possible that the company also plans to release a separate 5G device. Rumors suggest a 5G phone from the company will see a price increase of $100 over the normal going rate for a OnePlus phone (the 6T debuted at $549 (£499, AU$599), so the company may decide to keep this a separate entity entirely. We're reporting live from the Snapdragon Summit all week and hope to have far more details about the chipset that will be powering the first 5G OnePlus phone as well as a variety of other devices in the next couple of days. What is the Qualcomm Snapdragon 855 chipset?